The CPI course, and especially the zoning class, armed me with new tools to help my community. Soon after graduation, Bettye was inspired to form the Belmont Alliance Civic Association - Registered Community Organization (RCO) for Belmont West. The RCO allows neighbors near proposed developments to give input if the developer is requesting to do something different than what the zoning allows. As Chair of the RCO, Bettye has made sure that her residents have a voice in neighborhood change. She has used her CPI skills and knowledge to bring together residents & stakeholders to talk about many zoning cases and development requests. She has also been able to apply CPI’s lessons to improve public spaces in her neighborhood. Bettye noticed many young children and parents waiting for the buses along Lancaster Ave in Belmont with nothing to do. Where others saw wasted time, she saw potential. 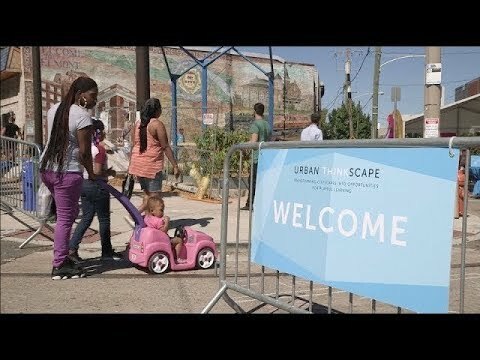 Together with Temple U, the BACA CDC helped build the Urban Thinkscape Project at 4001 Lancaster Avenue, a play/learning installation to engage children and their parents while waiting for the bus. There is no slowing down for Bettye! She wants to continue to engage her residents and create great spaces for them to come together. Her next plan is to build a Cultural Center and “Belmont Commons” an indoor/outdoor social space for everyone in the neighborhood. September 2018: Learning Landscapes: Can Urban Planning and the Learning Sciences Work Together to Help Children?